Elephants killed for their ivory. Habitat becomes roads and villages. We encourage the peaceful co-existence between humans and elephants that enhance the survival of elephants and protect their habitats. 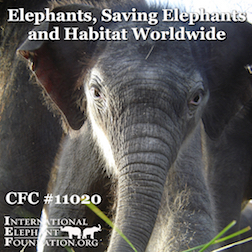 Help us create a future where elephants thrive. Sometimes the "wild" isn't so friendly. For Elena, a tiny, injured, and malnourished baby Sumatran elephant, that was the case. Living in one of the few remaining forest fragments of Sumatra, Elena could not keep up with her mother and the rest of their herd due to her injury. IEF's Conservation Response Units (CRUs) had discovered her while on patrol and were dutifully monitoring her over a period of weeks, hoping her condition would improve. As Elena became weaker and weaker, her mother and herd were unable to care for her during their daily search for food and water. At that point, the CRU TEAM determined she needed immediate veterinary intervention in order to survive. As a member of a critically endangered species, Elephas maximus sumatranus, Elena is a precious member of the roughly 1800 remaining Sumatran elephants. Together with their expert veterinarian, the CRU team nursed her back to health while healing her injured leg. Now she is thriving, growing and spunky like all little elephants should be! She is also an important member of the CRU team, which already boasts adult "Aunt" and "Uncle" elephants who aid in the regular habitat patrols. The Aunt and Uncle CRU elephants knew exactly how to welcome Elena into their herd because shortly after her arrival two of the females gave birth to their own calves?Cory and Linda. Today, Cory, Linda, and Elena run around and play, while also accompanying their families on patrol. They are vital jumbo steps away from extinction. No longer an orphan, Elena is together with the CRU herd as one giant family.